What is grammar? It encompasses the words you choose, how you string them together, and how you punctuate them to give them meaning. 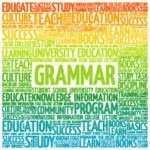 To recognize National Grammar Day, which falls on March 4, this post examines 11 sentences that demonstrate why grammar matters. I point out the grammatical errors in each and offer a suggested rewrite. Examples are the best teachers. 1) Just today, we actually got a press release that basically said that CreateSpace was disbanding their author services part of their business. Just, actually, the first that, and basically add nothing to meaning or clarity. Today’s CreateSpace press release announced that it will disband the author services part of its business. 2) I personally actually travel a lot, so I plan to bring this alarm clock along with me everywhere I go!! Personally, actually and along add nothing to meaning or clarity. I plan to take this alarm clock with me in all of my travels. 3) Eric was told not to go by his boss, ostensibly because he was working too much overtime. It’s unclear which he was working too much overtime. Ostensibly, which means apparently or purportedly but perhaps not actually, can be more succinctly expressed. Eric’s boss told him not to go because of what he considers Eric’s excessive overtime. 4) After briefly mentioning an official’s alleged affair with his staff member earlier in the week, Stephen Colbert took a deep dive into the story Wednesday night. Briefly mentioning is redundant; to mention is to make a brief reference to. Did the affair occur earlier in the week? Or was the affair just mentioned earlier in the week? “An official’s alleged affair with his staff member” is unclear: Whose staff member? The official’s or Colbert’s? Early in the week, Stephen Colbert mentioned an affair between an official and the official’s staff member. Colbert delved into the story Wednesday night. 5) Nestled in your opulent guest room with luxurious bedding and special amenities, the Drisco’s thoughtful staff will be there to anticipate your needs and carry out your wishes. Drisco’s thoughtful staff members are not nestled in your opulent guest room. As you nestle into the luxurious bed of your opulent guest room and enjoy the Drisco’s special amenities, responsive staff will anticipate your needs and carry out your wishes. 6) Right after we got off the train we were trying to get our bearings and two lovely Chinese girls asked us if we needed help in excellent English. The girls were not asking the travelers if they needed help with excellent English; rather, they spoke excellent English when they asked the travelers if they needed help. Right after we got off the train and were trying to get our bearings, two lovely Chinese girls asked in excellent English if we needed help. 7) After speaking to residents, the stranger discovered that animal rescue teams had been attempting to catch a feral dog that roamed the area for five long years with no success. The feral dog had not experienced a lack of success as it roamed the area for five years; those on the animal rescue team had no success in catching it. What is the difference between five long years, five years, and five short years? After speaking to residents, the stranger discovered that animal rescue teams had been attempting — without success — to catch a feral dog that had been roaming the area for five years. 8) Since language is fluid, does it follow that all new usages, since they are not incorrect, can be used in business settings? Since (used twice) means from then until now. A double negative — are not incorrect — in nonstandard English. Can traditionally implies ability; may implies permission. Because language is fluid, may all new usages — although not yet universally accepted — be used in business settings? 9) The reason why they were furious was because the products Pauley mentioned are half the price and twice as effective as theirs. They were furious because the products Pauley mentioned are half the price of and twice as effective as theirs. 10) The report does not dispute that Trump fired Comey because he was unhappy with his continued pursuit of the Russia investigation. He and his are ambiguous: to whom to they refer? The report does not dispute that Trump fired FBI Director Comey because the president was unhappy with the director’s continued pursuit of the Russia investigation. The writer was referring to her own memoir, not one about the life and legacy of David Carr. Grammar is not a set of rules carved in stone; it’s a collection of guidelines that help you communicate clearly. Kathleen Watson has a love/hate relationship with grammar; she loves words and the punctuation that helps them make sense, yet she hates those pesky rules. Knowing others do, too, she wrote an easy-to-use grammar book called Grammar for People Who Hate Rules to help people write with authority and confidence. How will you celebrate National Punctuation Day? Share your ideas here. Did you celebrate National Grammar Day on March 4th? I think it needs to be celebrated all year ’round especially when it comes to business writing. What’s the best way to recognize Grammar Day? Spend extra effort to make sure your sentences, whether spoken or written, are grammatically correct. How do you know what’s correct? Let me direct you to my colleague Kathleen Watson’s new reference book, Grammar For People Who Hate Rules: Killer Tips From The Ruthless Editor. This week only, Kathleen is offering it in ebook form for only 99 cents, downloadable on Amazon. This special offer expires at midnight on March 8, so act now! This is one resource I use often and highly recommend! Subconscious vs. Unconscious: What’s the Difference? A reader asked me to discuss subconscious and unconscious, clarifying the implications of prefixes sub and un. First of all, conscious means to be awake, aware, and responding to one’s surroundings. A prefix is a letter or a group of letters that appears at the beginning of a word and changes its original meaning. Substandard living conditions contribute to poor health. The subcommittee will investigate the cost of the proposal. She is so unlike her twin sister in temperament. The soaked jacket was unwearable. Trevor has a subconscious fear that his girlfriend, Jenna, will break up with him if he goes fishing this weekend. At a subconscious level, Jenna hopes her boyfriend, Trevor, will go fishing this weekend so she can use it as an excuse to break up with him. To be unconscious means to lose consciousness. When Trevor fell in the fishing boat and hit his head, the jolt left him unconscious for a few seconds. When Jenna learned that Trevor’s fall had left him temporarily unconscious, she couldn’t be mad at him for going fishing — or use it as an excuse to break up with him. Our language is full of prefixes: anti (antidepressant), bi (bilateral), dis (disassemble), extra (extracurricular), infra (infrared), inter (interoffice), multi (multicolored), non (nonfiction), out (outperform), over (overpay), para (parasailing), post (postgraduate), pre (precondition), re (reintroduce), under (underestimate). Note that none of these words created with a prefix requires a hyphen. My new book Grammar for People Who Hate Rules has a list of words with these and other common prefixes, most of which don’t require a hyphen. Kathy has a love/hate relationship with grammar; she loves words and the punctuation that helps them make sense, yet she hates those pesky rules. 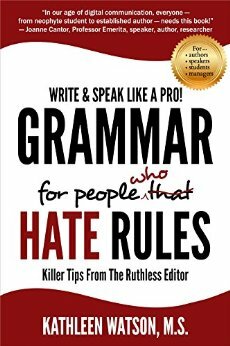 Be sure to check out her new book Grammar for People Who Hate Rules (great title) at Amazon.com now!